Having showcased its expansive next-generation TV on a number of occasions, Korean tech giant LG has finally revealed pricing and release date plans for its 55-inch OLED TV offering. Set to hit stores in the final three months of the year, LG has confirmed that wannabe owners of the world's largest OLED TV will be able to pre-order the high-end system from July, assuming they can afford the premium €9,000 price tag (£7,217). The culminating of years of research and development LG has brought together its 4-Colour Pixel and Colour Refiner technologies to form an OLED display that is being touted as the most true-to-life screen to date. 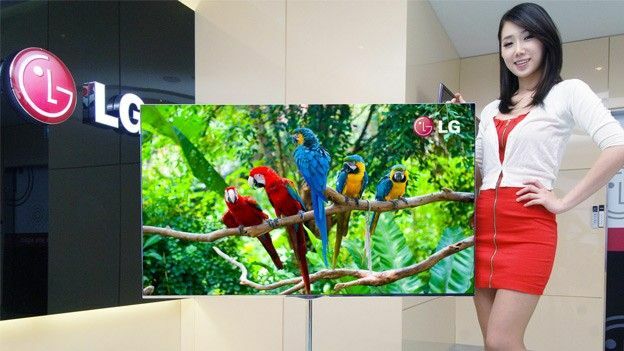 While the screen quality will impress it's the dimensions that will then take your breath away, at a staggering 4mm thin, the LG 55-inch 3D OLED TV is to be one of the thinnest panels available, making it slimmer than an iPhone 4S and less than half the thickness of a Samsung Galaxy S2. "OLED is clearly the future of home TV entertainment and LG is very focused on making this exciting technology as easy as possible for consumers to embrace,” LG Electronics CEO Havis Kwon said. One of the key advantages of OLED over say LCD or LED (as seen in Samsung's UE55D8000) is the speed, boasting a responsiveness that is over 1,000 times that of either. Add to that the ability to be packed into a much more compact design and you've got a product that could well steal the show as one of the most desirable gadgets of 2012. Are OLED TVs the future or will their extravigant price tags take too long to come down to make the technology a widespread option? Let us know what you think via the T3 Twitter and Facebook feeds. We take a look at what's going to be big news in televisual technology this year...and no, it's not all HDR. This is what Google's Android for a TV looks like..